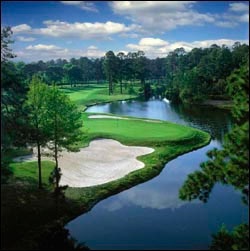 Indigo Run is right at the center of Hilton Head Island, South Carolina, which makes it a prime location with convenient access to a variety of destinations. The sprawling 1,700-acre community is a private gated one offering shopping, dining, and beach options within easy reach. The community is distinct from other Island communities for being the youngest planned community on Hilton Head Island. Thus its homes are newer with more up-to-date finishes and open floor plans than many of the other homes on the Island. As a private golf community, the crowning glory of Indigo Run is its two Nicklaus golf courses. The country’s first Jack Nicklaus II course called the Golf Club Course is the community’s pride. The second widely recognized course with a layout inspired from Nicklaus Design is called the Golden Bear Course. This outstanding golf course has its own clubhouse and is used for regional tournaments. The Golf Club Course is a private members-only golf course with a highly exclusive membership of only 340 members. It includes a fitness center and a clubhouse for casual and fine dining. Some of the amazing amenities at Indigo Run include an Olympic-sized swimming pool at Sunningdale Park. It also has a kids’ wading pool, sun decks, and a complex with six clay tennis courts fitted with state of the art machine practice equipment. For competitive tennis lovers, the community hosts tennis league competitions for men, women, and mixed teams. A fine range of dining and shopping options are available right outside the community’s gate. Some of the popular options include Barnes and Noble, Outback Steak House, Atlanta Bread Company, Publix, Wal-Mart and many other shops, banks and offices. Indigo Run encompasses many secluded communities, such as The Preserve at Indigo Run, which is a lock and leave villa neighborhood; the River Club, which has several homes located right on Broad Creek; Berwick Green, which is a collection of luxury villas and garden homes; and River Club, which features homes with boat docks. If you have questions about specific homes or real estate in general, contact us. We're happy to help find your dream home or homesite to build on.